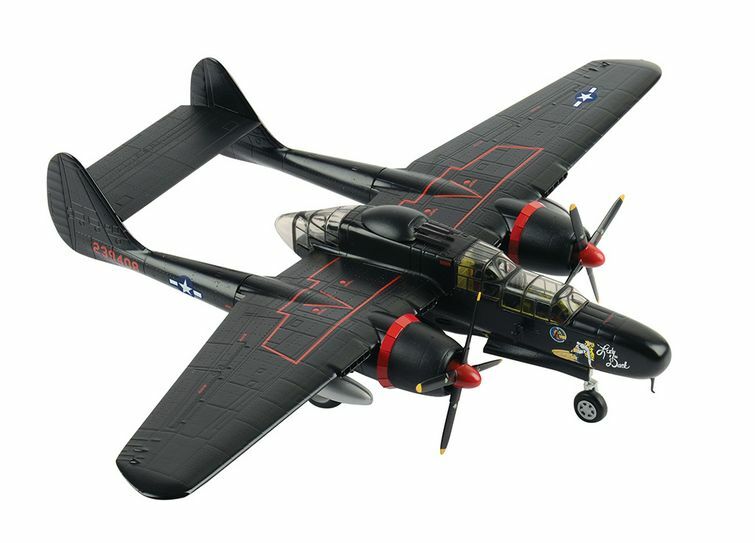 Air Force 1 Northrop P-61B Black Widow – In Stock Now! The heavily-armed Black Widow—the United States’ first aircraft specifically designed as a night-fighter—first flew on May 21st, 1942. The P-61 had four forward-firing 20mm cannons and a dorsal turret housing four .50-caliber machine guns. The radar equipment in its nose enabled its crew to locate and attack enemy aircraft in total darkness. The twin boom arrangements housed two Pratt & Whitney turbocharged engines and were joined at rear by a large plane and twin rudder formation. The pilot was seated in the main fuselage, with the gunner immediately behind him and the radar operator at the rear of the gondola. 548th NFS, #42-39408 “Lady in the Dark”, Le Shima Island, August 14th 1945.